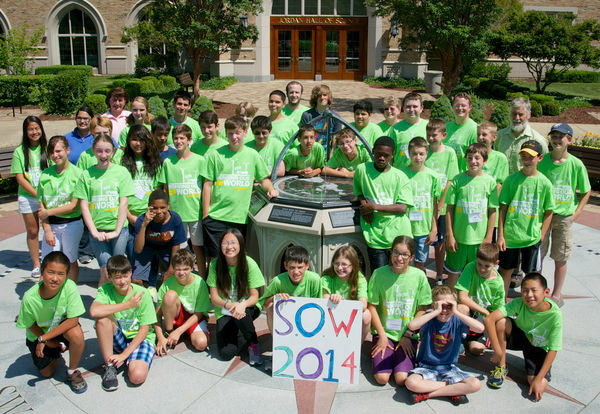 Sensing Our World, a summer program for middle school students led by Gordon Berry, emeritus professor of physics, was held in the Jordan Hall of Science last week. The program encourages experimentation in science, mathematics, and technology through hands-on activities. This year the program focused on the conservation and transformation of energy. Throughout the week, the students visited the Notre Dame’s power station, the wind turbines, the Museum of Biodiversity, the Snite Museum of Art, and the Digital Visualization Theater. The students learned about a variety of energy subjects, including, temperature, climate, and extinction. By the sundial outside the entrance to Jordan Hall, the students set up their own sundials using paper and pencils. Each hour, the students observed where the sun fell on the pencils and cast a shadow and marked the shadow as it moved across the paper. At the Snite, students observed how gravity and wind moved and changed George Rickey’s sculptures, and then they made their own mobiles. When asked about their favorite moments, many students said one highlight was building their own battery-powered robots out of LEGOs. The robots were able to race and throw objects, and the experiment culminated in a competition between robots. At the end of the week, the students used the knowledge they had gathered to create their own games involving different forms of energy. The students then presented their mobiles and games in the Galleria. Instruction throughout the week was led by two middle school teachers, Nate Cole (St. Joseph Grade School) and Pat Chrenka (LaSalle Academy), with support from two Notre Dame physics graduate students, Ed Lamere and David McKenna, and from Christina Mai, a senior at Marian High School. 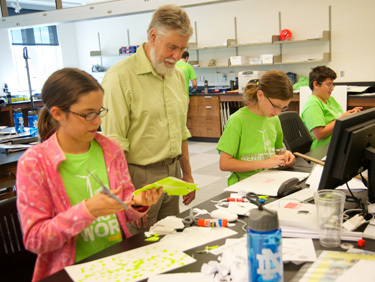 Originally published by Jayme Russell at science.nd.edu on July 15, 2014.